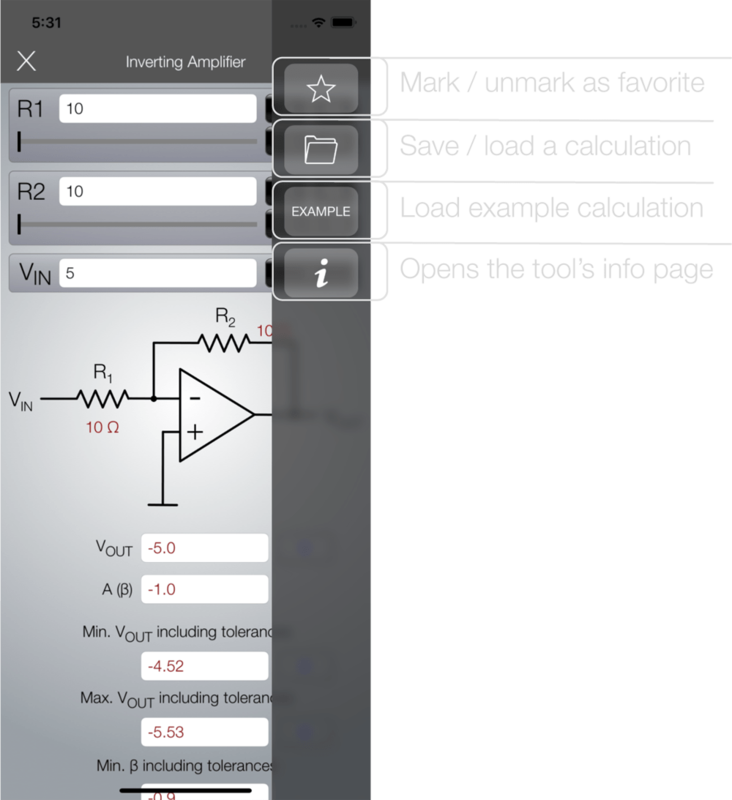 EE-ToolKit Tutorial - Electronics Engineering Apps. PRO. 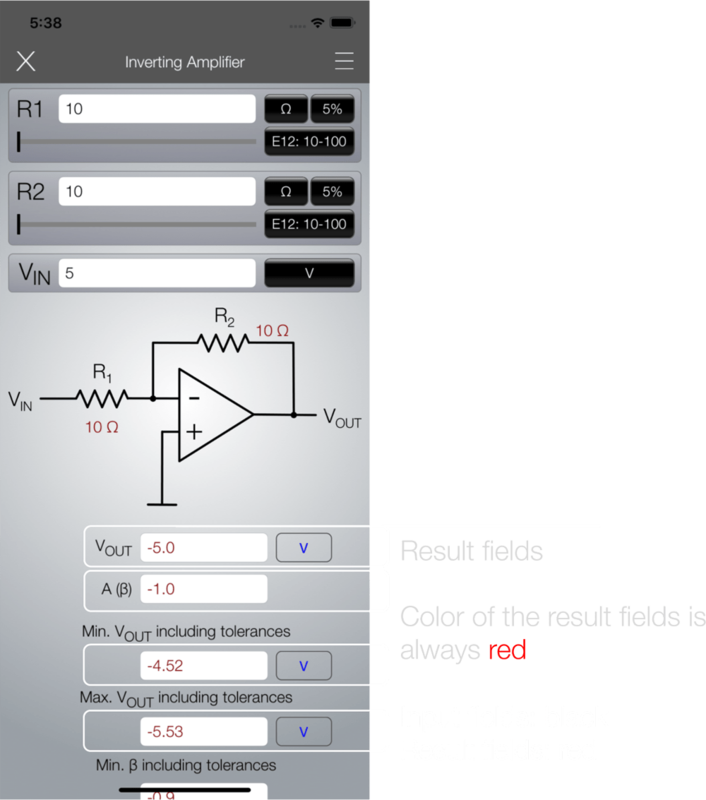 EE-ToolKit Tutorial – Electronics Engineering Apps. PRO. 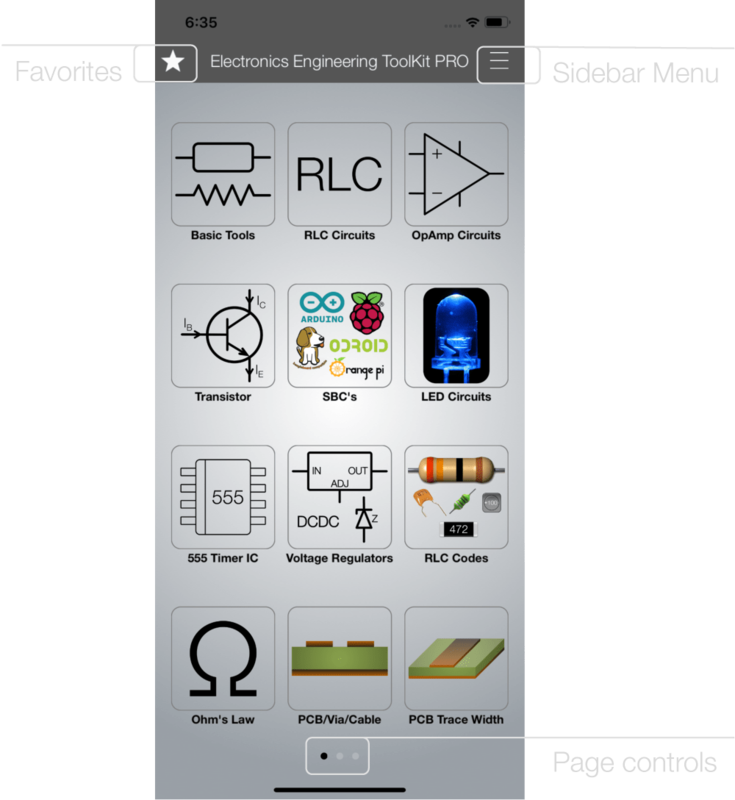 The home screen of the EE ToolKit. The star icon on the left side brings you to the Favorites view (you can mark each tool a favorite and it will be shown here). The burger menu icon on the right side opens the sidebar menu, see more info below. Centred at the bottom is the page controls. 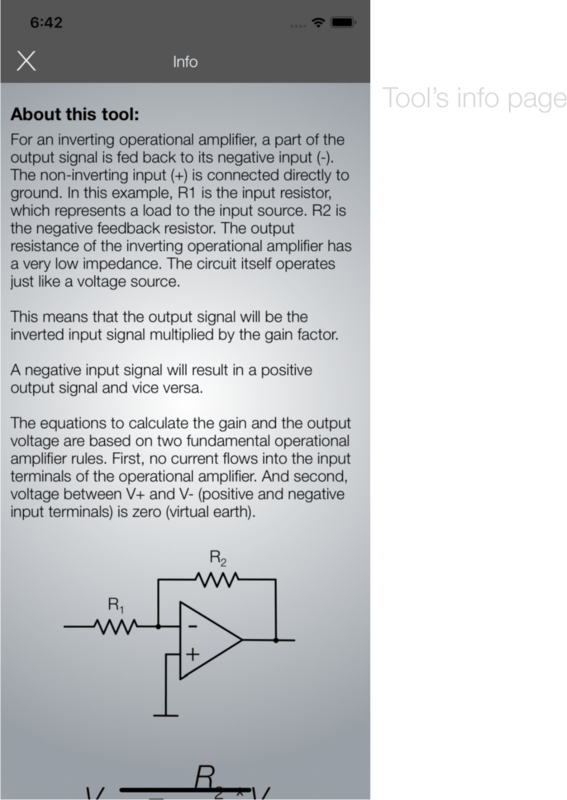 The main interface of the EE ToolKit consists of three pages, that you can swipe through. The sidebar menu provides access to the settings, your iCloud for e.g. datasheets, the formula search and the About page, which includes information like contact E-Mail, Release Notes, Copyright, Version Information. For entering input values, just tap on one of the text input fields. The respective keyboard loads up and you can enter values via the keypad. 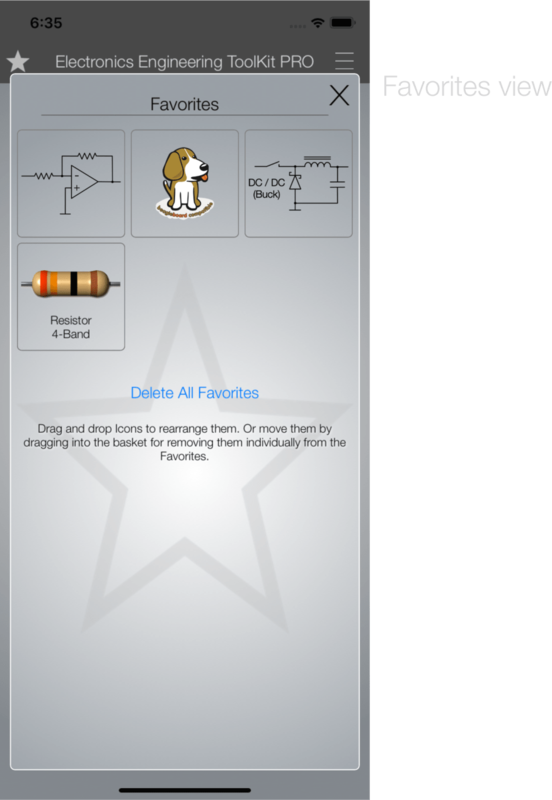 In this example, we are using a Resistor keypad. 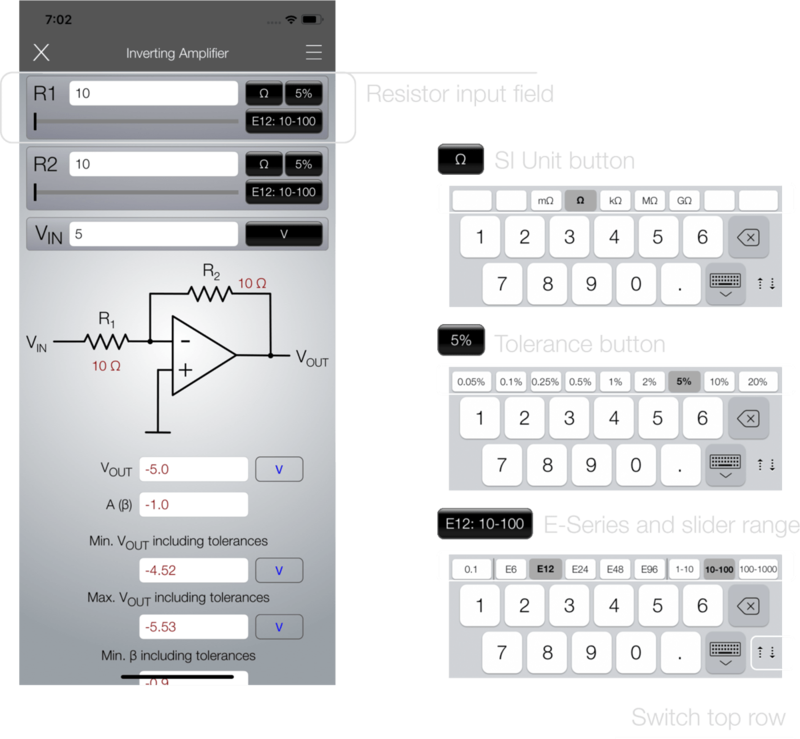 You can set units, tolerances and even E-Series with slider ranges. Tap on the bottom right button on the keyboard to cycle through the settings. All results are shown in red color. Input fields are always shown in black color, results are red. Next to most result fields you can find a unit selector button.  Tap on the unit selector button next to a result field to open the selector. “Auto” means that the result will be formatted automatically to the best readable format. But you can also select one of the other options and the result will be formatted accordingly. Each tool has its own sidebar menu options. Tap on the burger menu icon to open it. The star icon is used to mark or unmark a tool as favorite. If marked, this tool will show up in the Favorite View. Tapping on the folder icon will show a popover menu for saving and for loading of calculations. The example button is used to load a default set of values, also the initial values of the tool. And tapping on the info icon will open the info/about page. The EE ToolKit features an integrated File Manager. 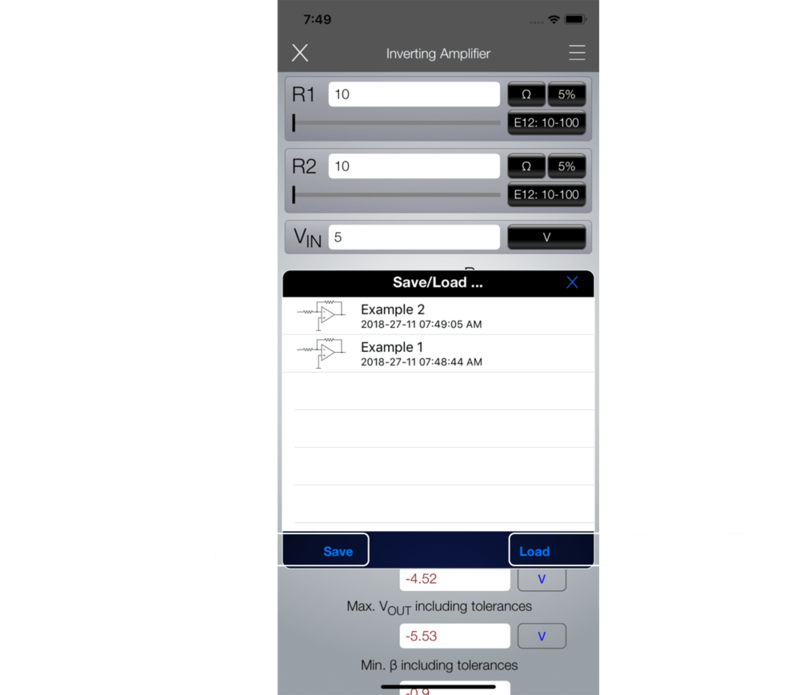 For every tool there is the option to save as many calculations as you want to and re-load them at any later point in time. Just tap on the folder icon in the sidebar menu and the browser will appear. After saving, the data is stored locally in the App and also synced in iCloud, so it even transfers to your other devices running the same App. Each tool has its own info page, an about page that provides more explanations about the tool and the used formulas. Each tool or calculator can be selected as Favorite and it will show up in the Favorite page. This provides a very quick access to your most favorite tools. The order of the Favorites can be rearranged. In order to do that just touch down and drag an icon to another position. The EE ToolKit also features a Formula-Search Tool. You can search the complete formula database of the EE ToolKit. 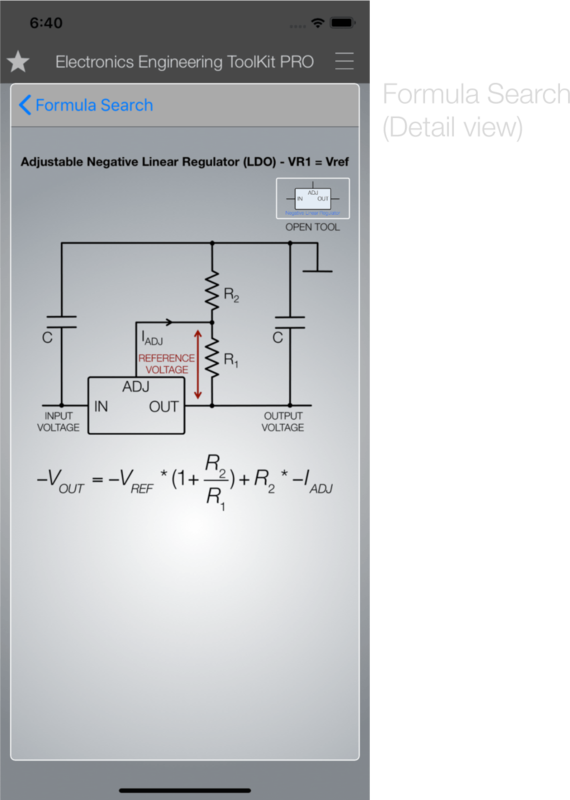 A summary view shows the formula and the related schematics (if available) and a direct link to the respective tool. Jump right from the formula into the calculation! 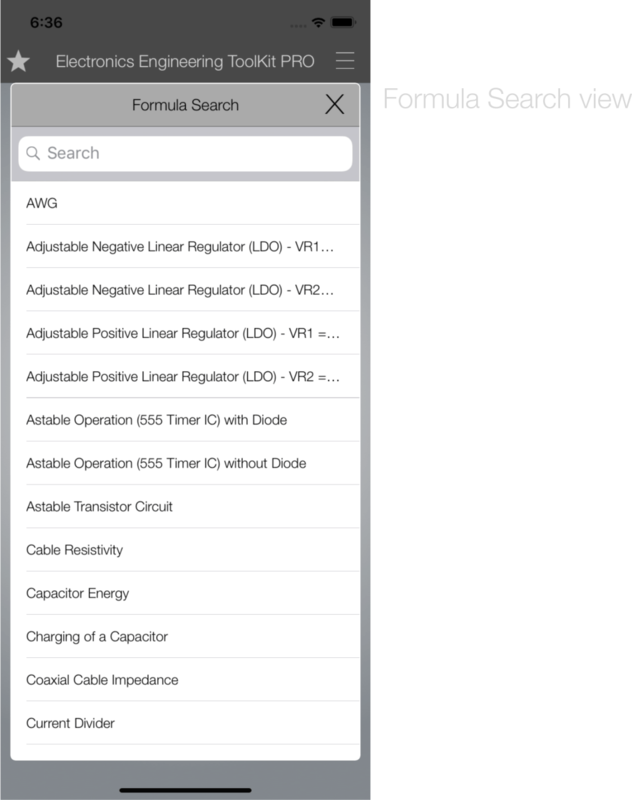 The detail view of the formula search. 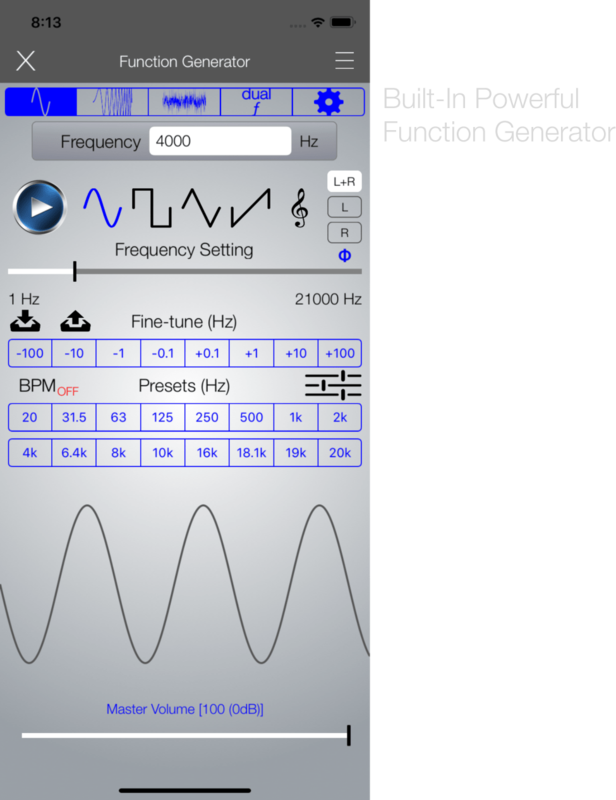 Please Note: the MultiTone Generator is only available in the Audio Function Generator App or in the MultiTone Generator App (where it can be used with Audiobus).